Once we talked about the great Australian dream. Now it's something meaner: "getting ahead". The great Australian dream meant owning your own home. "Getting ahead" means getting ahead of someone else. It's how Treasurer Scott Morrison sees the Australian dream. "I think it is great in this country that people want to aspire to do better and provide for their kids, so I don't judge people for actually wanting to get ahead," the treasurer told radio host Neil Mitchell a few weeks back. "That's what this country is about." It's certainly what negative gearing is about. "The vast bulk of Australians who use negative gearing are just trying to get ahead and trying to get their family in a better position," Morrison says. But negative gearing only gets them ahead if prices climb. The more that people negatively gear in order to get ahead, the more prices climb. The further they climb, the harder houses become to buy. And the harder they become to buy, the more the Australian dream recedes. This is what has happened. Back before the explosion of negative gearing around the turn of the century, 52 per cent of Australians aged in their mid-20s to mid-30s actually owned their home. At the most recent census in 2011 it was 47 per cent. Before the turn of the century, 70 per cent of Australians aged in their mid-30s to mid-40s owned their own home. It's now 64 per cent. The negative gearing-driven explosion has made it harder for Australians to buy houses to live in. Here's how Luci Ellis, head of the Reserve Bank's financial stability department, puts it: "It's a truism that if an investor is buying a property an owner-occupier is not." It gets better, for investors: "To the extent that person is not then buying their own home, they are therefore creating a market for rental and making it attractive to purchase investor properties." Betting on prices going up becomes a self-perpetuating machine. 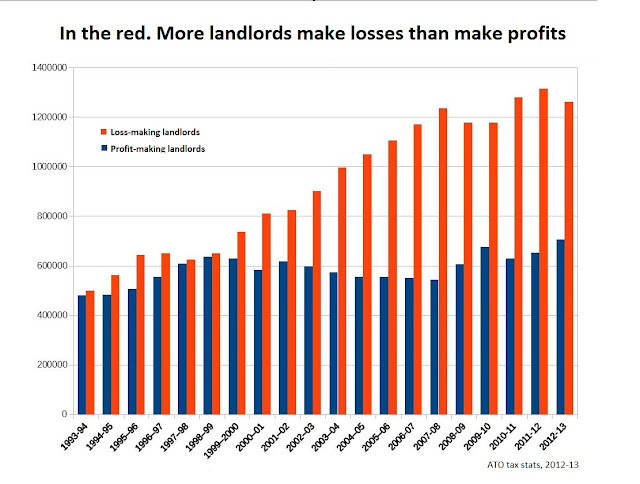 The further they climb out of reach of owner-occupiers, the more the Australian dream recedes and the more renters there are to rent to, which allows investors to bet still more on prices rising. "Some have said we are on track to becoming a kingdom where the Lords own all the land and the biggest Lord will be King and the enslaved serf tenant is paying rent to the Lord to become wealthier," he told the Financial Review. "Is that an over-dramatisation or is it very, very close to the truth?" A landlord-heavy housing market is inherently unstable. Whereas owner-occupiers aren't that likely to sell if interest rates rise or prices threaten to stop climbing, landlords can run for the doors. The Property Council makes the point dramatically in an advertisement depicting housing as a house of cards. One way to wind things back would be to gently limit negative gearing. It's an idea endorsed by the Murray Financial System Review and now the Business Council of Australia. It's Labor policy, and despite Morrison's talk about the need to support mum and dad investors (over mum and dad buyers), it might yet be adopted by the Coalition in some form. Alexander's committee was considering limiting the amount of mortgage interest that could be deducted from wages. At the moment it's 100 per cent. That proportion could be adjusted by an authority such as the Reserve Bank to keep the market stable. And the committee was considering extending to owner-occupiers the concessions afforded to investors. Right now investors get to deduct interest payments from their income for the purpose of determining tax. Under the proposal owner-occupiers could opt to have a portion of their interest payments treated the same way. If for example they chose to deduct 20 per cent of their interest payments from income they would be taxed on 20 per cent of the eventual gain when they sold. Every time a negative gearer sold to an owner-occupier the government's tax position would improve, the housing market would become more stable, and more Australians would be protected from poverty in their old age. The changes in politics at the end of last year saw Alexander removed as chairman of the committee and another chair appointed who has also since moved. The report was due at the end of last year, but it will now be finalised later this month as soon as another chair is appointed. Public opinion backs Alexander, just. This week's Essential poll shows 34 per cent of Australians would prefer lower housing prices and 32 per cent would prefer higher prices. Landlords strongly favour higher prices. For a while, before politics overtook things, it looked as if we would have a sane discussion about what our headlong rush into negative gearing was doing to us. I'm hoping it's not too late. Prime Minister Malcolm Turnbull has been claiming for weeks that Labor's plans for negative gearing would smash house prices. "The 70 per cent of Australians who own houses will see the value of their single most important asset smashed to fulfil an ideological crusade," he told parliament. His Attorney-General George Brandis​ has made it sound even worse. "There is one thing we know about the negative-gearing debate," he told us. "If the Labor Party were to implement its policy, the value of most Australians' homes would collapse". His assistant treasurer Kelly O'Dwyer​ briefly said the opposite. Labor's policy would "increase the cost of housing for all Australians; for those people who currently own a home and for those people who would like to get into the housing market". And then his treasurer Scott Morrison latched on to a "credible report" that said Labor's policy would have "a significant impact on property values". He latched on too quickly. The report, by BIS Shrapnel, said no such thing. Prices would continue to rise in all but two of the next 10 years under the scenario it modelled, just as they would if negative gearing was maintained. After a decade, they would have climbed 15 per cent. That's less than with full negative gearing, but its still an increase. The report explained that house prices are typically "sticky in a downwards direction," unable to fall lower than the cost of construction plus a markup. When new attempts at negative gearing were temporarily suspended between 1985 and 1987 real estate prices continued to climb. While new investors would be less keen to buy if Labor's policy stopped them negatively gearing, existing investors would be also less keen to sell, because they could only continue to negative gear if they hung on to the properties they had. Prices wouldn't be smashed. Certainly his eyes appeared to glaze over the howling error on page one. The report said Australia's national income would average $190 billion over the next ten years when it meant $1.9 trillion. And they appeared not to be troubled by its suggestion that a measure that raised around $2 billion per year would shrink the economy by $19 billion per year. That's $9 of economic damage for every $1 collected, a sum so big as to be way out of the ballpark of anything his department has ever modelled. When Treasury modelled a range of taxes for its tax discussion paper, it found the worst of them, stamp duty, did 70 cents of economic damage for each dollar collected. Yet first thing Thursday morning on AM Morrison described as "credible" a report that found removing negative gearing would create multiples of the biggest damage his department could find. The Grattan Institute's John Daley says the finding doesn't even pass the giggle test. Try it for yourself. Attempt to say: "a tax that raises $2 billion will shrink the economy by $19 billion" without laughing. What's really odd about the report is its false precision. Limiting negative gearing would create 175,000 fewer jobs over ten years. The unemployment rate would settle at 5.9 instead of 5.8 per cent. And its woolliness. It assumes away the role of the Reserve Bank in stimulating the demand as economic growth slips, and also the role of state governments in controlling the release of land to regulate the housing market. The oddest thing is its origin. Who commissioned it? BIS Shrapnel won't say. Why did it release it instead of the client? And was the whole idea to get a gullible politician to swallow and regurgitate it so that the public became even more confused and decided any change was too risky? It's happened before, in the mining tax debate, in the carbon tax debate and whenever anyone suggests anything that might hurt the superannuation industry. 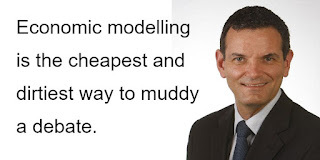 Economic modelling is the cheapest and dirtiest way to muddy a debate. It lends an appearance of authority to what amounts to guesswork, with key mechanisms often deliberately or accidentally left out. The Australia Institute wants a code of conduct for economic modellers. There's one for auditors and accountants. They'd have to spell out their assumptions and who was paying them. Right now, with the enthusiastic assistance of people who should know better, we're being had. And we don't even know by who. Hillary Clinton is misguided. Her opposition to the Trans-Pacific Partnership is based on "misinformation". Malcolm Turnbull's new trade minister says so. Within hours of being sworn two weeks ago, Steven Ciobo eschewed the traditional approach of getting up to speed and consulting widely, and blundered into the US presidential race. "I am not surprised that the trade union movement and, of course, the political arm of the Australian Labor Party is on a similar platform to, for example, Hillary Clinton," he told the Financial Review. "They both derive their key support from the union movement." The woman most likely to be the next US president, the former secretary of state who ran America's missions abroad, the woman who criss-crossed the world pressing flesh about the Trans-Pacific Partnership, knows less about it than Steven Ciobo. Asked directly whether he thought her opposition to the TPP was based on misinformation, he replied: "Absolutely". And he was going to clear it up. "I will not take a backwards step in terms of putting forward the clear truthful situation in the face of an ongoing campaign of misinformation," he said. So what is the clear truthful situation? What is it that Clinton (and also Trump) are failing to grasp? The awful truth is that Ciobo's department isn't particularly keen on finding out. Back in 2010 the Productivity Commission found little evidence that Australia's trade agreements to that point had "provided substantial commercial benefits". It recommended the government first work out what it wanted to achieve, review its goals annually, and enter into trade negotiations only if they were likely to meet those goals and only after examining alternatives, including the alternative of "no further specific action". The examination would be independent and made public. When the agreement was complete and about to be signed it would be examined again by an independent body which would produce a public assessment of the costs and benefits. None of those things have happened with the Trans-Pacific Partnership, the biggest trade deal in Australia's history. Set to take in nearly 40 per cent of the world's economy including Australia, Canada, Singapore, Brunei, New Zealand, Chile, Mexico, the United States, Japan Malaysia, Peru and Vietnam, it will encourage us to buy and sell from each other rather than the rest of the world, and it will tie us to common (largely US-driven) standards. Former trade minister Andrew Robb signed it in Auckland last month without commissioning any outside analysis. His department's so-called national interest analysis, required by law, ran to just 19 pages, most of which merely summarised the 6000 page agreement. 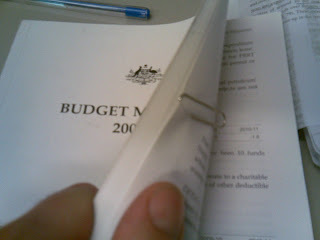 New Zealand's national interest analysis ran to 277 pages. The modelling that's been done overseas finds the benefits for Australia close to non-existent. The World Bank finds that after 14 years the agreement will have boosted Australia's GDP by 0.7 per cent. Depending how you round it, that's a boost of either 0.0 or 0.1 per cent per year. A separate study by Tufts University in the US concurs, but says the growth will come at the expense of jobs, around 39,000 after 10 years. The agreement won't exactly "drive jobs and growth". Willful blindness over the benefits wouldn't matter so much if there wasn't also wilful blindness to the costs. The Department of Foreign Affairs and Trade appears to have never examined any of Australia's 18 free trade agreements after the event, but the Australian National University has. Ten years after the US-Australia free trade agreement it found it had cut rather than boosted trade. That's because free trade agreements help and hinder trade. By rewarding trade within a group they penalise trade outside the group, even the use of foreign-tainted inputs which can see entire classes of exports labelled non-compliant. Businesses find it easier not to import from outside, or not to use the agreement. And they miss out on getting benefits they could have had years ago. The TPP promises tariff cuts worth $135 million over four years. But they could have been delivered without the TPP had the government not held them back, possibly in order to have tariffs to negotiate away. Because we've comparatively few barriers to negotiate away we've been under pressure to agree to other things, like tighter copyright rules and extra-territorial tribunals to which foreign firms (but not our own firms) can take the Australian government after losing their case in Australian courts. It may be that these concessions are worthwhile. It would be good to know, and it's not too late. The TPP may have been signed, but it won't come into force until at least half of its members have ratified it, including Japan and the United States. The parliament's treaties committee is examining it now and is accepting submissions until Friday March 11. I'd feel better about the whole process if I didn't have a sneaking suspicion that leaders, including our prime minister, know full well that its not such a great deal and wouldn't much mind if the US kicked it over.